When it is good, living abroad with a host family can be very, very good. You can make new friends, see new places and immerse yourself thoroughly in a new culture complete with local languages and slang, foods, customs, music, books and even television programmes! But when it all goes wrong, living abroad with a family can be horrid. To make sure that you're host family experience falls into the former, follow the three C's of living abroad with a host family: Communication, Cleanliness and Caring. Clear communication is perhaps the most important ingredient to successfully living abroad with a host family. Only when everyone involved knows what is expected of them - and what to expect in return - can honest relationships develop. To avoid cross-cultural confusion after you move in, make sure to iron out certain details before you descend upon your host family. Ask where you will sleep and store your possessions, if you will eat with the family or cook your own meals and where you will store any food or snacks you purchase? Is is also important to arrange access to laundry facilities and cooking equipment, communication technology such as the Internet and telephone, your responsibilities regarding younger children and pets and any chores you will be expected to complete. While you are meant to feel like a part of your host family while you are living abroad, leaving your dirty laundry all over the floor will not endear you to anyone. Your mother won't be around to remind you, so be sure to up your cleanliness quotient while you are living abroad. Putting all dirty laundry in a hamper or laundry bag washing laundry on a regular basis, hanging up wet towels and laundry and cleaning your bathroom regularly, will show the family that you are respect them and their home. There are other clean tasks should do during your stay such as; changing your sheets weekly, washing up after you prepare food and/or eat a meal or snack, wiping down all kitchen surfaces you may have soiled, keeping all school or work supplies neatly tucked away, leaving any room as clean as you found it and pitching in during a general family clean up. Bringing a host or hostess gift when you arrive. Offering to cook a traditionally British meal for the family. Helping to plan a day trip or family outing. Assisting with family scheduling and chores. Duplicating photos that you take of yourself and your host family. Selecting meaningful parting gifts when it is time for you to return home. 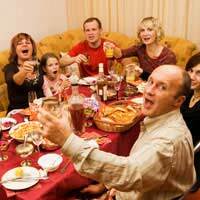 Living abroad with a host family should be a time for you to truly experience a new culture. With a little bit of communication, cleanliness and caring, living abroad with a host family will be an exceptional experience that you will never forget!